Celebrating it’s 40th year of highlighting local and international artists and artisans, the Toronto One of a Kind Christmas Show & Sale is an annual favourite of mine to visit, and this year offered even more to do, see, and shop for! 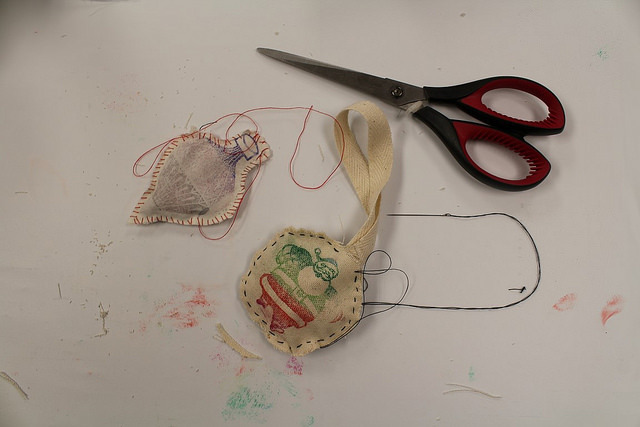 I started the day off at one of the three Hands-On Workshops that OOAK was offering this year – presented by Coy Depot, making vintage stamped Christmas Ornaments. 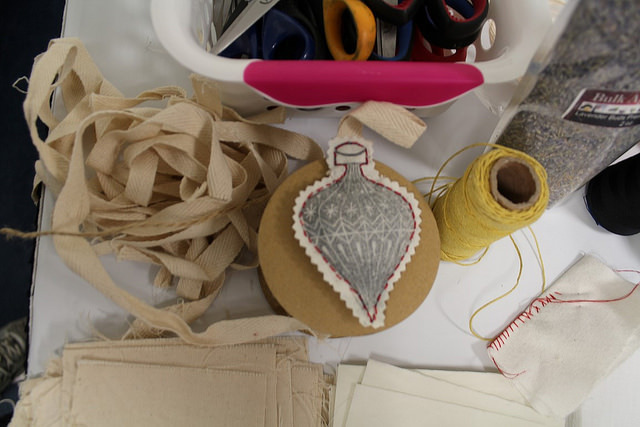 The show seemed bigger and better this year – but before we get to all the goodies for sale, I want to tell you about the super-fun morning I spent with Coy Depot and a couple dozen other crafty ladies in the Vintage Holiday Ornament Workshop. The morning started with a snack-box of breakfast treats and coffee. I was a few minutes late, so I was trying to sneak in and munch on my mini muffin without disturbing the instructor as she started to describe what we’d be doing. 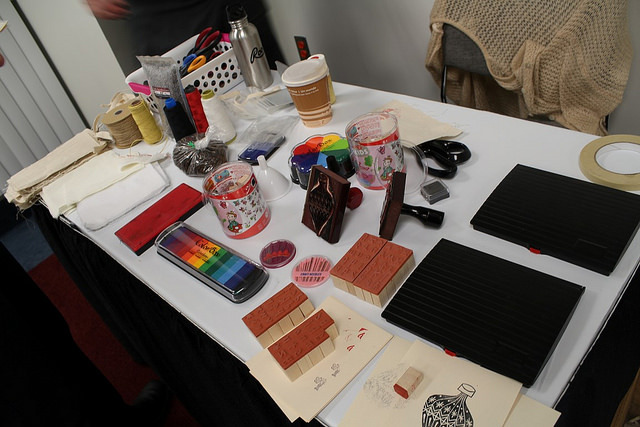 All the supplies we would need were at the front of the room, fabrics, thread, stamps, and paper. If we put it all together correctly (honestly, there was minimal instruction but Lisa did continually circle the room, offering any advice and answering all questions that came up), we would end up with a clove, or lavender, filled trinket like this one. Some of the other ladies in the class were just phenomenal at the sewing, whereas I was simply trying to do my best not to stab my finger and bleed on my craft. It was fun, though, and after an hour or so of diligent focus, I managed to create a couple of ornaments that I’m proud of. 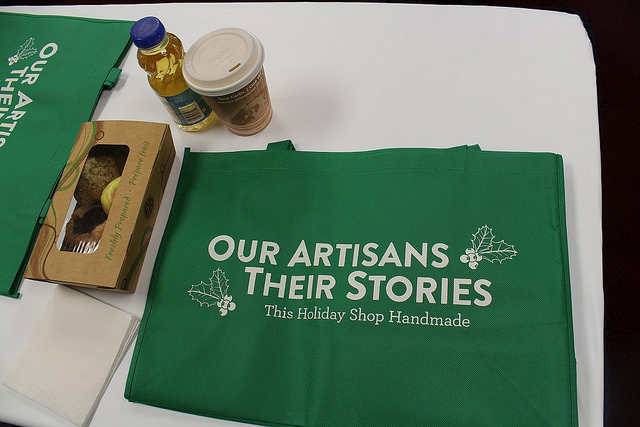 As crafty as I like to think of myself as – I’m definitly more of a Christmas Shopper, so I was happy that the Workshop included admittance to the Big Event itself! I don’t know if having missed the show last year has changed my perspective or if the space was actually bigger and better – but it seems to me that they have rotated a few repeat-type shops over and there’s a much bigger variety of things. 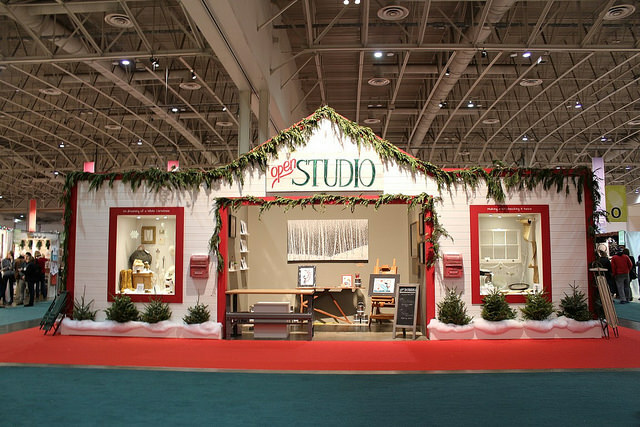 Below, you can see our entire gallery of the workshop and One of A Kind Christmas Show 2014!